With the common name of Spiral Gingers, Costus are a tropical to sub tropical species grown as an ornamental understory plant. These attractive flowering plants come from Australia as well as Africa, China and South East Asia. They differ greatly in both flowering and growth habit, however many very ornamental forms are available for sale. 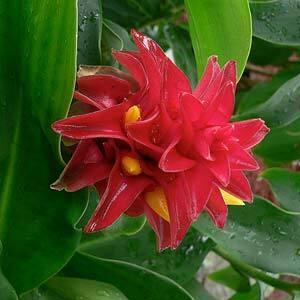 Costus are distinguished from other gingers by foliage, it grows with a spiral habit around the main stem. They are also listed as Cheilocostus and Chamaecostus as recently some species have been renamed. Other names include Monocostus and Dimerocostus. Costus come in many forms, from low growing mounded plants to taller growing Costus vareties. Costus speciosus can grow to nearly 2m. C. erythrophyllus has nice pink flowers. C. cuspidatus, C.productus (Costus comosus) are others to look for. Some Costus species produce flowers on the stems, others produce basal flowers. These are the ones that from at the base of the plant such as on C. erythrocoryne. In China they are used as a medicinal plant and have been for many years. Easy to grow, they prefer partial sun and do well in rich, moist well drained soil. Excellent both as garden specimens or container plants. Flowers form at the end of growing tips in midsummer through to early autumn, some species will flower from the base. New plants form where old flowers have been, roots will actually form in the air and as the ‘new plant’ grows the weight will drag the branch down to the ground where the roots will take hold and a new plant will take root. In colder climates you can grow these plants with a little care. Plant them in spring as the weather warms up, keeping them in a warm protected position. With a little luck they will produce flowers well before the cold of autumn comes around. You can also grow them in pots and bring them indoors or onto a warm patio over winter. Position – Dappled shade is best. Watering – A dryish winter is important. Watering should not commence until spring when new growth is evident. Fertiliser – Fertilise in spring, use a slow release organic fertiliser, or to[ dress around the plant with compost and aged cow or sheep manure. Prune – In winter, cut the plants back to the ground as the foliage begins to look a little ragged. Propagation – Usually by root division of established clumps. Also by the natural production of plantlets on the stem. C. barbatus or ‘Red spiral Ginger’. C. igneus ‘ ‘Fiery Costus’ or ‘Spiral Flag’. The yellow flowering (spectacular) C. spectabilis which is the floral emblem of Nigeria. C.woodsonii ‘Red button Ginger’ or ‘French Kiss’. C. stenophyllus the ‘Bamboo Costus’. Use this one as a bamboo alternative, attractive banded brown and cream stems, flowers are red and the plant will reach nearly 2m in height. C. “Belize Yellow” – Yellow cones with Red Flowers. Golden Yellow – Green cone with yellow flowers.